New Mustang Real Carbon Fiber Interior Dash Kit This is the ultimate Mustang Dash, nothing comes close to are Quality and Finish! Look and you can see we make the best Carbon Fiber in the world! The other guys may have Mustangs. No one has this Hot Dash like this! They will drool all over your car! Be special and make your MUSTANG Special! We have everything carbon available for your Mustang! Look close and you can clearly see the time and effort to make such a beautiful grille! This is a direct fit part! This are hand made per order! Let me make a special Mustang for you! Any Question Just Ask Thank You Joe. 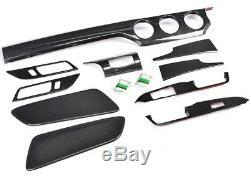 The item "2015-2016 Mustang Carbon Fiber 10Piece Dah Kit Overlay 3 Twill" is in sale since Saturday, February 10, 2018. This item is in the category "eBay Motors\Parts & Accessories\Car & Truck Parts\Exterior\Spoilers & Wings".